red KitchenAid Mixer and red splatter ware tray...and making playful shadow figures on the mottled green kitchen cabinet wall to keep me company while I bake. and, along with a cup of hot tea, helps repel the winter doldrums, or at least delay their onset. on its own, with nothing but a luscious mound of moist green moss and the texture of a beautiful concrete planter to enhance its striking foliage. 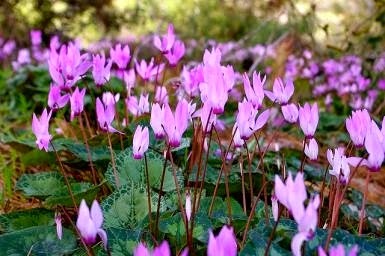 Cyclamen will reward you with long blooming color if you keep it constantly moist over the winter months. Saturate its root mass, but please, no water on its foliage or flowers as this may encourage fungal problems and leaf rot. It is the perfect plant for a cool to cold windowsill. (Remember it is a winter bloomer, after all.) Ideal temps are between 50-60 degrees. Temps over 68 during the day, and under 40 at night (for non-hardy varieties) can cause problems -- yellowing leaves and drooping, unhappy buds and flowers. Bright light without direct sun makes a superb growing environment. Setting the pot on a saucer of gravel filled with water will make it love you back, and provides the extra humidity it craves in the dry, heated air of our winter homes...and also helps to keep spider mites at bay. I have had success planting them outside in my concrete urns, with delicate alyssum, dianthus, pansies, violas, moss, ivy and fern...even baby lettuces. but a lovely gardening risk worth taking.....with those sweet little winter-loving cyclamen. To learn more, join me and Linda Cavanaugh today on 4 YOUR GARDEN on NewsChannel 4 at 4:30.